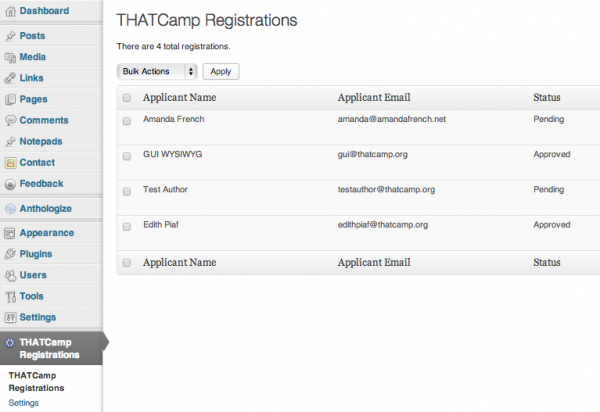 You can use the THATCamp Registrations plugin to accept registrations for your THATCamp. Expect a 15% cancellation rate. Most THATCamps choose to make all participants user accounts with Author privileges on your site. Use these sample emails to reply to participant registrations and prompt them to propose sessions. 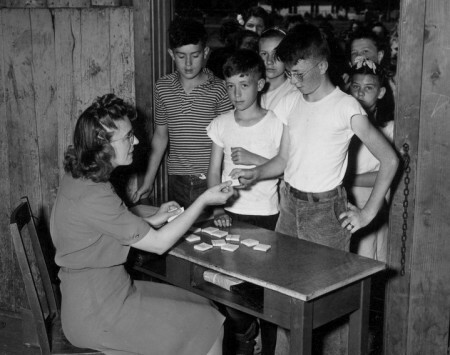 One decision you’ll need to make is whether to pick and choose who you’d like to attend your THATCamp (i.e., accept applications) or whether to accept everyone on a first-come first-served basis (i.e., accept registrations). That decision is up to you, but in general, we recommend that you set a quota based on how many people you can accommodate (for instance, 75 people) and then accept everyone who applies as long as you have space for them. This is more in line with THATCamp’s principles of openness, and it simplifies logistical decisions such as meal planning. Moreover, most THATCamps don’t fill up, and even those that are oversubscribed don’t usually have to disappoint more than 10-20 people. (There are plenty of THATCamps these days for people to attend!) You can run a wait list if more people want to come than you have space for. Our experience shows that for local THATCamps, about 15% of registrants will cancel or simply won’t show up. The exception to this rule is THATCamps held in conjunction with other large events for which people have made extensive travel arrangements. After all, THATCamp is usually free, or nearly so, so unless people have booked flights and hotels, there’s not much of a commitment, and emergencies and conflicts will inevitably crop up. Most cancellations will happen in the last few days before the THATCamp takes place. If you plan for 100 people, you can safely accept 115 people and be confident that you’ll have enough coffee when the time comes, since at least 15 people won’t show up. You can type the shortcode in either the “Visual” or the “Text” tab. This will automatically generate a registration form for users to fill out. You can show or hide certain fields on the form in THATCamp Registrations –> Settings, but otherwise the registration form can’t be customized on a per-site basis. You can, however, add some text by typing it at the top of the “Register” page you created. See also our page on building a THATCamp website for instructions on using the plugin. Here are some sample emails to participants to send when their registration is Pending or Accepted (these can be entered directly into the THATCamp Registrations Settings) and when it’s time to remind or educate them on proposing unconference sessions. Feel free to adapt these for your own use. Most THATCamps are free, but we do allow THATCamps to charge up to $30 USD per person for registration. 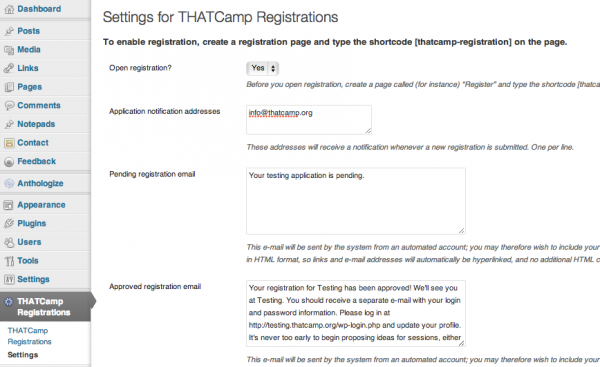 There basically isn’t a way to require the payment of a registration fee before registering, however, at least not with the THATCamp Registrations system built in to all thatcamp.org sites. The reason is more social than technical: all of the 150+ (and counting!) THATCamps are financially separate, so we haven’t been able to hard-code in a payment system that’ll work for all of them. The way most THATCamp organizers do it is to collect the registration fee in person when the registrant checks in at the THATCamp. Some people have also chosen not to use the THATCamp Registrations system, routing registrations through some other system that will accept payment, such as a scholarly association’s payment system. Finally, go to Appearance –> Widgets to add a PayPal donation link to your sidebar. If you choose not to use the THATCamp Registrations system, you can add users to your thatcamp.org website by going to the Dashboard menu item “Add Multiple Users.” The easiest way is to get a list of e-mail addresses separated by commas, then go to Add Multiple User –> Import Email List and paste in the list of comma-separated email addresses. Make sure that the users have Author privileges after you add them so that they can post session ideas, session notes, and other items to the blog. And be sure to let them know that they should fill out their user profile and should begin contributing to the blog! If you are using the THATCamp Registrations plugin, you can get a list of registrants’ emails and other registration information with the “Export to CSV” button at the top right of the THATCamp Registrations screen. This will output a .csv file (comma-separated-values file) that can be opened in a spreadsheet application such as Excel. Remember that you may have users on the site who did not submit a registration (such as administrators or organizers). You can also get a (very messy) .csv file of user information via Users –> Export to CSV.